VERACRUZ — Security forces in Veracruz are warning that a wave of violence is taking place as the Zetas and Cártel de Jalisco Nueva Generación engage in a battle over territory. Two attacks in two bars last weekend left seven people dead and many wounded, while another three people were killed in two other incidents. 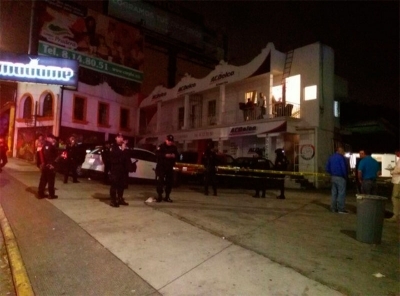 In the capital city of Xalapa, four masked men carrying assault rifles stormed a bar called Madame about 1:00 am Sunday and began firing at a specific area inside, killing four and wounding a dozen. At least 200 federal forces personnel and state police descended on the scene, along with two helicopters, but the perpetrators escaped. At just about the same time came a report of a gun battle in the Bull Dog bar in Orizaba. When police and soldiers arrived they found several people wounded — and others prepared to carry on shooting. In the subsequent shoot-out two of the aggressors were killed. The initial battle is believed to have been between rival crime gangs. Hours later in the municipality of Cuitláhuac, sicarios, or hitmen, assassinated two people riding in the back of a pickup truck on a state highway, while in Amatlán the operator of a trucking company was murdered. Samuel Vela, 29, of the firm Centauros, was ambushed by two armed subjects while he was driving on the Córdoba-Potrero Nuevo highway near Seco River. On Saturday, armed men raided a church in the city of Veracruz while a confirmation ceremony was under way. After yelling at those present — many of them children — to get down on the floor the invaders questioned an individual in the church before kidnapping him as crying youngsters looked on. The state’s Public Security Secretary later said the kidnap victim is believed to be a gang member himself. State authorities say they recorded 402 homicides from January through April, 249 of which were intentional. Gangs are fighting over territory to carry out extortion of businesses, steal Pemex fuels, traffic in drugs and gain political control over election candidates, bureaucrats, mayors and police. Sunday’s violence triggered worried reaction on social media, where citizens demanded improved security from Governor Javier Duarte.